Diaper rash happens! Be prepared with this new cream that creates a moisture barrier, allowing skin to dry out and heal. This diaper cream from Thinkbaby is mineral-based and sure to relieve diaper rash irritation, because no matter how much you prepare, it's never fun to see a rash on your little one. 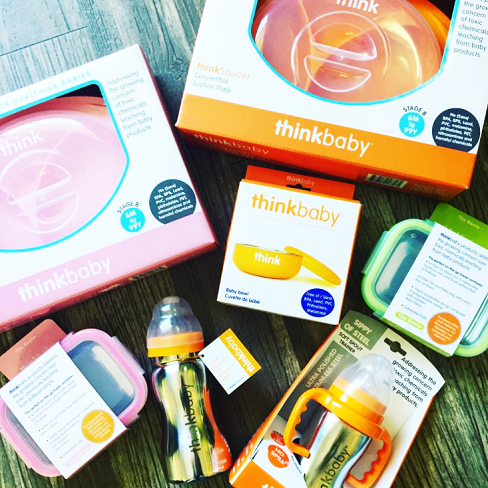 Thinkbaby has a long history of building safe, non-toxic products for babies to athletes (Thinksport). Their mineral-based diaper rash ointment furthers their movement into baby body care with an ingredient list made up of natural and organic ingredients. Their ingredients pose the least potential for allergenic response or biological harm. Thinkbaby Diaper Rash Ointment is great at soothing skin and designed to help prevent diaper rash. The product is unscented and should be applied to dry skin for best protection. As with all their products, there is no animal testing involved. 1. Cleanse the diaper area. 2. Allow to dry or pat the area dry with soft towel. WebMD suggests using water unless the diaper was soiled then use a very mild cleanser. 3. Apply cream liberally as often as necessary, with each diaper change, especially at bedtime or any time exposure to wet diapers may be prolonged. 4. For particularly bad rashes, you might also consider allowing your child to go diaper free for some period to allow for faster healing.